Lot 13. 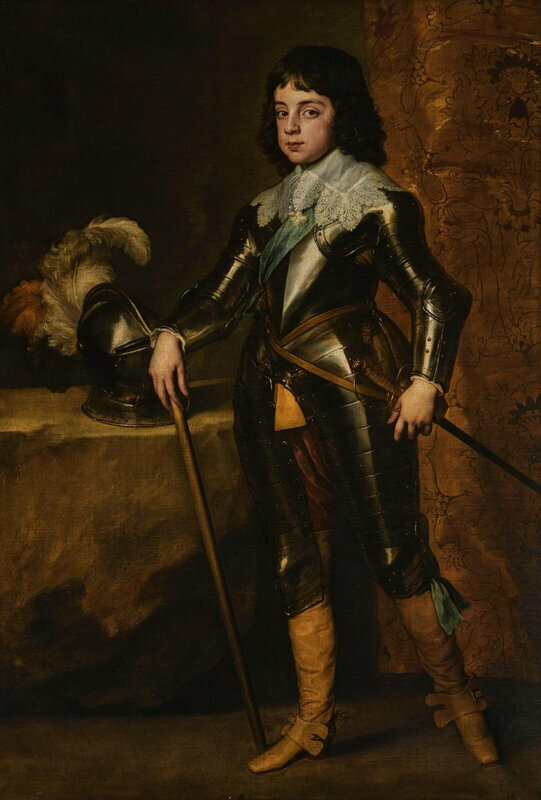 Jacob Isaacksz. 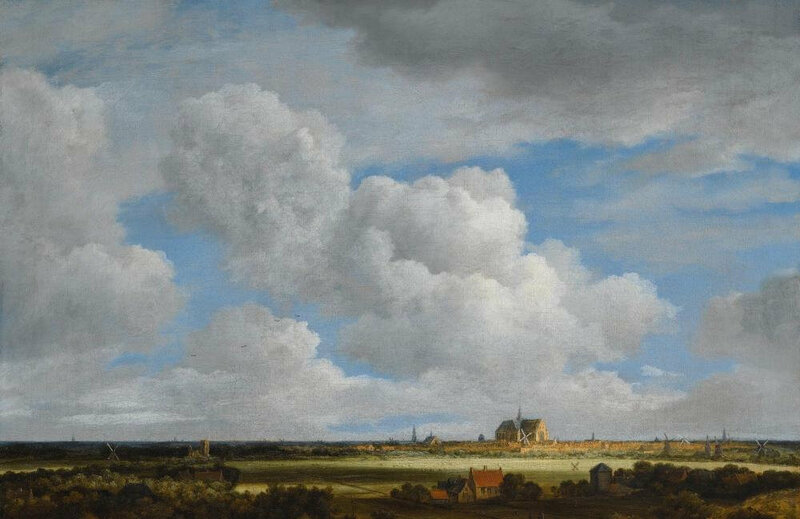 van Ruisdael (1628-1682), A Haarlempje: a panoramic view of Haarlem and the bleaching fields seen from the north-west, signed lower left: JvRuisdael oil on canvas, 53.5 x 67.5 cm. ; 21 1/8 x 26 5/8 in. Estimate 1,500,000 — 2,000,000 GBP. Lot sold 2,650,000 GBP. © Sotheby's. By whom sold to the present owner before 2004. New York, Metropolitan Museum of Art, on loan from Ernest G. Rathenau and Ellen Rathenau Ettlinger, 1951–1995 (inv. no. L.51.35.2, always as Ruisdael). S. Slive, Jacob van Ruisdael: Master of Landscape, exh. cat., New Haven and London 2005, p. 220, under no. 91. Note: We see the distant city of Haarlem on a breezy summer’s afternoon from the dunes to the north-west of the city, looking across the low-lying bleaching fields. This is a Haarlempje, a genre that belongs to Ruisdael, in which he celebrated his native city and its setting in a series of painted panoramas done throughout the 1660s and the first half of the 1670s.1 They are widely regarded as among his finest achievements. Nearly all of Ruisdael’s Haarlempjes depict the city from the north-west and north for the simple reason that the elevation of the dunes in these directions from the city affords the best array of sites from which to view it in panorama due to the sparser trees – the region to the west being more thickly wooded.2 Ruisdael also painted views from the heights of the same dunes, but looking north, and he also painted views of Alkmaar, a city further north, that are very similar in style and mood to his Haarlempjes. The expression Haarlempje appears to date from Ruisdael’s lifetime, since it occurs in an inventory drawn up in 1669, and it has been used ever since. Ruisdael was not the first artist to make panoramic views of Haarlem seen from afar: his most famous predecessor was Rembrandt, for example in his famous 1651 etching The Goldweigher’s Field; but in a series of some twenty known paintings, most done after he had moved to Amsterdam, he catechised his native city. Despite the modest scale of all of them, Ruisdael’s Haarlempjes give an overwhelming sense of monumentality. This is partly to do with the skies – different in each work – which are as much his subject as the distant city dominated by the towering bulk of the Sint Bavo church. In this painting, towering cumulus clouds are swept across the picture plane from the west by the driving westerly wind coming off the North Sea outside the picture plane to the right (if the viewer were to turn 90 degrees to the right from the present viewpoint, he would probably be able to see the sea, or at least catch the reflection of the westering sun on the wave-tops). The meteorology is borne out by the patterns of slanting late afternoon direct sun passing between the clouds, illuminating parts of the city and the west façade of the Sint Bavo, shining on the luminous green of the bleaching fields, well-watered by the Atlantic weather and the springs emerging from beneath the dunes, catching the tops of the oak trees in the more fertile land that lies between the dunes and the bleaching fields, and accentuating the paler colour of the exposed sand of the dunes in the foreground. Meanwhile other parts of the panoramic view are cast into deep contrasting shadow by the clouds, setting up a network of contrasts. Ruisdael used warm and cool colours, not merely light and dark tones, to capture the patterns of light and shade across the panoramic view.3 His favoured time of year in many of his paintings of diverse subjects – late summer or early autumn, when the heat of the summer has darkened the foliage of deciduous trees such as oaks – aided him in his task. In some Haarlempjes the uppermost leaves of some trees are showing signs of turning brown, but in this one, only the stunted wind-blown oak shrub on the top of the dune in the foreground, where the sandy soil is at its thinnest and driest, has succumbed to the changing of the season. Jacob van Ruisdael, Extensive Landscape with a View of Harleem. Black chalk, gray wash, with figures in pencil, 9.9 x 16.1 cm. Inv.nr T95-1946, Cat.nr.T18. The Hague, Museum Bredius. © Museum of Bredius, The Hague. Seymour Slive included this work in his category of dubious works in his Ruisdael catalogue raisonné, although he had earlier accepted it, rejecting Giltay’s doubts, which in turn had been based on those of Martin, and not on inspection in the original. Slive wrote that he was 'now less certain of the ascription to Ruisdael'. He considered that the staffage was by Johannes Lingelbach. 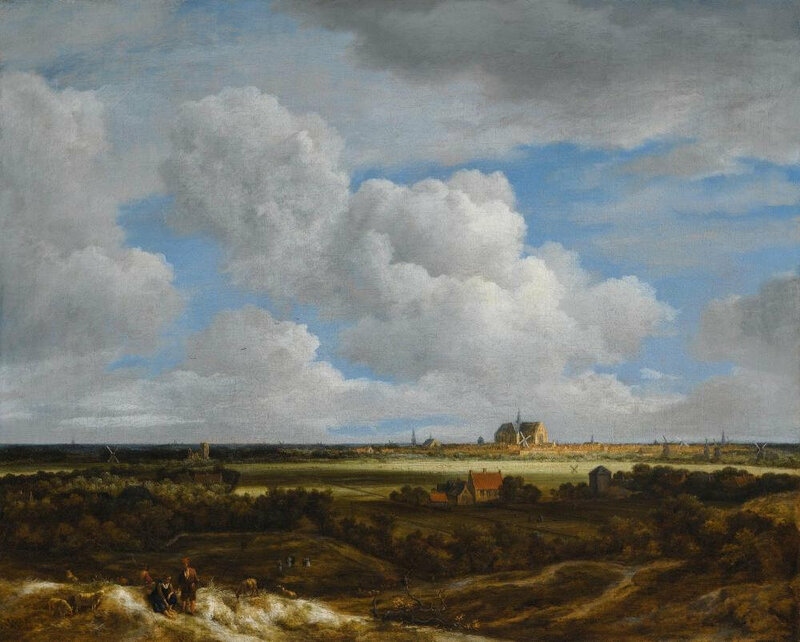 One aspect of the present picture that gave him doubts was the lack of integration of the immediate foreground into the rest of the composition, and he observed that this might mean it could be a relatively early Haarlempjeby Ruisdael, from around 1660. In fact, the same characteristic can be observed in another early Haarlempje from the early 1660s, a view taken from probably only a few hundred yards to the left, and including the country house Hartelust.7 In it the ridge of a dune in the foreground runs the entire width of the composition, completely segregating foreground from middle ground. We are grateful to Frits Duparc, who collaborated with Seymour Slive on the ground-breaking Jacob van Ruisdael exhibition held at The Mauritshuis, The Hague, and the Fogg Art Museum, Cambridge, Mass., in 1981–82, and who is the current leading authority on Jacob van Ruisdael, for endorsing the attribution. In his opinion the present painting is a characteristic Haarlempje by Jacob van Ruisdael. We are grateful to Bart Cornelis for proposing that the figures in the lower left foreground are by Ruisdael’s frequent collaborator Adriaen van de Velde (1636–1672). Maurice Kann was born in 1840 into a banking family in Frankfurt, for which he subsequently worked in Paris and London. He made his fortune however in diamond and gold mining in South Africa, in conjunction with his younger brother Rodolphe, who was also to amass a considerable art collection (their cousin Alphonse Kann was also a significant collector). According to René Gimpel, the Kann brothers housed both their collections in a substantial property at 49–51 Avenue de Iéna. 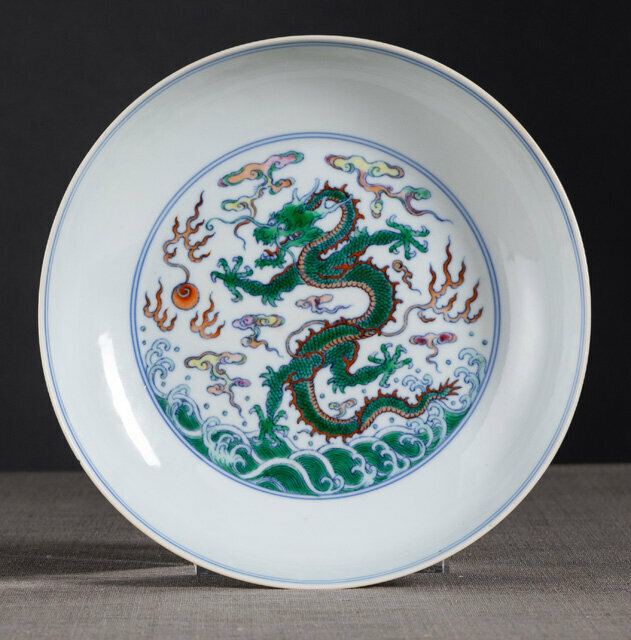 Following his death in 1891 Maurice's collection was dispersed in a series of sales in Paris and Vienna between 1905 and 1911, and in 1909 a significant part of it was acquired en bloc by the Duveen brothers for $2.5 million. Maurice Kann clearly adored Jacob van Ruisdael: he owned at least fourteen paintings by him, including the View of the Dam, Amsterdam, in the Frick Collection and the celebrated Grainfields in the Metropolitan Museum of Art in New York. The present picture is one of two of Maurice Kann's Ruisdaels that passed in 1911 via the Paris dealer Francois Kleinberger to the Antwerp-born businessman and industrial chemist August de Ridder, whose collection was housed in his Villa Schoenberg in Cronberg in the Taunus hills overlooking Frankfurt, which he had built in 1891. Virtually all De Ridder's collection was acquired from Kleinberger, and much of it on the advice of Wilhelm von Bode. De Ridder died in the same year, and his entire collection was exhibited in the Städel in Frankfurt shortly after his death. His Will decreed that if his heirs wished to sell the collection, it should be consigned to his friend François Kleinberger, who included the present picture in his catalogue of works for sale, also published in 1911. Later, in 1913, the entire collection was shipped via Paris by Kleinberger, and exhibited in his New York dependance late in the same year. A catalogue of his collection, written by Wilhelm von Bode, was also published posthumously in 1913, one year before Von Bode's catalogue of Kappel's collection, and thus probably a sale brochure. Marcus Kappel, who made a fortune through the grain trade, did not begin collecting seriously until he retired. Advised, like so many other Berlin collectors, by Wilhelm von Bode, he assembled a fine collection of Dutch and Flemish seventeenth-century paintings, including works by Rubens, Van Dyck, Pieter de Hooch, Adriaen van Ostade, Gabriel Metsu, Gerard Dou and Jan Steen, and at least one other Jacob van Ruisdael, which he displayed in a purpose-built top-lit gallery in his house at Tiergartenstraße 14. Von Bode was also responsible for the hang, done in imitation of the Kaiser Friedrich Museum, and a catalogue of the collection, published in 1914. Ernst (later Ernest) G. Rathenau was the nephew of the politician Walther Rathenau, Foreign Minister during the Weimar Republic, who was assassinated in 1922, and a grandson of Marcus Kappel. After studying law (doctorate 1919) Ernst Rathenau became a partner in 1922 and in 1927 the sole director of the highly influential publishing house Euphorion Verlag in Berlin, which in 1922, opened a bookstore for art literature, in which original graphics were offered. Together with original graphics, Rathenau published catalogues of the works of expressionist artists such as Erich Heckel, Karl Hofer, Ernst Ludwig Kirchner, Oskar Kokoschka, Edvard Munch, Emil Nolde and Karl Schmidt-Rottluff, which remain indispensable today. Banned by the Nazi regime, he emigrated to the USA in 1938, where he became a naturalized citizen, changing his name to Ernest, and settling in New York, where he first worked as a photographer, before returning to his profession as a publisher (the company he founded survives today). His return to Germany in 1950 may have occasioned the long-term loan of the Ruisdael and other pictures to the Metropolitan Museum, although he had already offered to lend it and a Jan van der Heyden to them in 1947. 1 Many artists imitated – or were inspired by – Ruisdael’s Haarlempjes, notably Jan Vermeer II van Haarlem and Jan van Kessel. 2 Pieter Biesboer, 'Topographical Identifications for a number of `Haerlempjes’ by Jacob van Ruisdael', in Shop Talk: Studies in Honor of Seymour Slive, Cambridge 1995, pp. 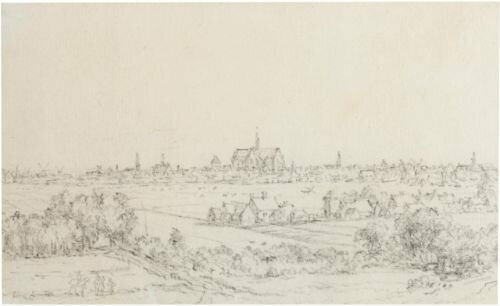 36–39, noted that some of Ruisdael’s Haarlempjes do depict the city from the southwest, from dunes near Heemstede that no longer exist. 3 This was described by E.J. Walford, Jacob van Ruisdael and the Perception of Landscape, New Haven and London 1992, p. 128, writing of the Haarlempje in The Mauritshuis, The Hague (inv. no. 155). 4 Black chalk, grey wash on paper, 9.9 x 16.1 cm. ; Museum Bredius, The Hague, no. T95-1946; see Giltay 1980, p. 161, and Slive 2001, p. 543, no. D67, reproduced. 5 Slive, 2001, pp. 80–81, under no. 55. 6 Inv. no. 416; Slive 2001, pp. 83–85, no. 59, reproduced. 7 Slive 2001, pp. 75–76, no. 48, reproduced; see also Slive 2005, pp. 220–21, no. 91, reproduced.